It is very rare when an already well-regarded starting pitcher puts forth a career-year at the advancing age of 32 but that is exactly what the Chicago Cubs’ Jon Lester achieved during the 2016 season. While the Cubs caught a ton of flak for the massive contract they gave Lester prior to 2015, the results have made that money well spent. Lester in fact took things to another level last season in winning 19 games for the best team in the majors, while posting career-bests in ERA (2.44) and WHIP (1.02). Lester also just missed running his string of 200-plus strikeout seasons to three in a row by finishing with 197 (good for a K/9 of 8.75). After a mid-career dip with the Boston Red Sox, Lester’s second wind as he entered into his 30’s has been beyond impressive. Being able to operate in the easier National League has also eliminated some of the shaky WHIP’s Lester put up in his Boston days and his arm can be included in the “rubber” class. Now Lester did get some decent BABIP help (a lucky .256) which when adjusted sent both his FIP and XFIP ERA above 3.40 but again nothing major in terms of possible red flags. About the only thing we might have to concern ourselves with when it comes to investing in Lester for 2017 is that he has thrown a massive amount of innings over the last five years and eventually he is going to have to pay the piper for that. We can’t ever predict when that might occur so continue drafting Lester as a more moderately priced ace for your fantasy baseball pitching staff. 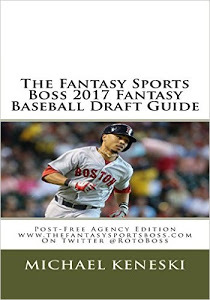 *****PICK UP THE FANTASY SPORTS BOSS 2017 FANTASY BASEBALL DRAFT GUIDE: POST-FREE AGENCY EDITION HERE FOR JUST $19.99 (PLUS $3.99 SHIPPING) USING THE BUY NOW TAB BELOW.